All of us, pay extra attention to even the tiniest of details of our wedding lehengas. We talked about the motifs, kalis, lace, borders, net and what not! After all, it is our bridal lehenga. We are bound to do it, aren’t we? But sadly, that lehenga is packed away, neatly in its covers and will always be at the back of your wardrobe forever. Isn’t that the usual story? But what if we say there are ways to reuse your bridal lehenga? Won’t that be wonderful? Here is how you do it. If your bridal lehenga is extremely pretty and you don’t wanna let go of it, this is your best pick! Take the lehenga and if it is too heavy, remove one or two borders to give it a simpler look. 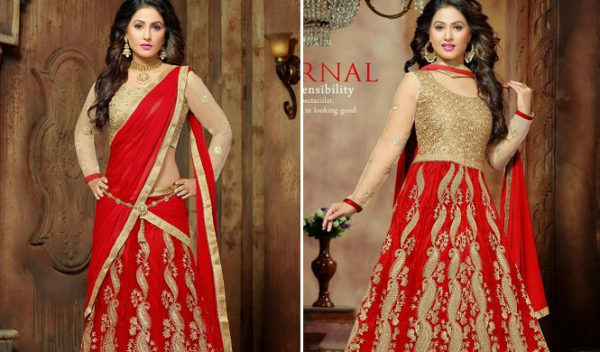 Now search for the best contrast color you can find that will look good with your lehenga. Trust your tailor on this and let him know how exactly your anarkali should be! This way, you’d be able to reuse and wear your bridal lehenga without receiving funny looks from people! If your wedding lehenga dupatta is extremely pretty with those embellishments or patterns, make a kurti out of it! You can wear this casually too. Pair it with a contrast colored leggings or palazzos, which are so in trend! Do some subtle makeup and a pop of lip tint, and you’ll be good to go! Don’t say ‘whaaat? ?’ You can do it easily! Like we said earlier, if you have a bomb dupatta, where the patterns, embroidery and the gota pati is perfect for a saree’s pallu, don’t think twice. Just go for it! Oh wait, you’re worried about the length is it? We have a solution for that as well! Firstly, you can use the same colored raw silk or satin to make it up to the length until the pleats. Or else, you can get a contrasting colored cloth, join it with your dupatta to make a gorgeous half and half saree! We mean break your outfit up, silly! Now you may have that burnt red blouse that’s simply beautiful and you don’t know what to make out of it? Pair it with a pleasant colored plain saree, to maintain the balance. You’ll still look gorgeous, trust us! The bridal lehenga can be reused too, take out some extra net, extra embellishments and make your wedding lehenga a bit simpler. 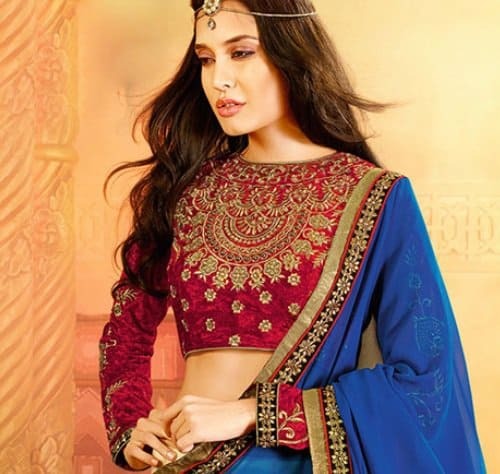 Pair it up some simple blouse and a choli to create a new lehenga! Another trending style is the long kurti paired up with a lehenga. This is the easiest look that you can try. Choose a plain and really simple kurta that can go with your bridal lehenga. Keep your jewelry as less as possible. Some kajal and lipstick, you’ll be ready to turn heads to that part you attend in this outfit! However, try to avoid the bridal colors like red and green in the kurta. Make sure you reduce the bling factor in it too!